With a fourth of the Earth’s population active on social media, business owners are quickly learning that social media is one of the top ways to reach potential clients. The problem is that many business owners don’t know where to start. It feels like there is a new social site popping up everyday, making it hard to keep up. Each social network has a different audience and a different purpose, and all of them may not be right for your business. Here are a few steps to deciding which social network is right for your business. STEP 1: Research your target audience. Every business has a very specific type of customer that they are targeting. Make sure that you take the time to write a profile of your ideal customer. Research their demographic, their job, their free time, their hobbies, etc. This will help you when choosing the your target audience’s social network of choice. STEP 2: Research the social networks. Below are the 5 main social networks along with a brief description to see if your target audience frequents these sites. Facebook – With over 1 billion users, this is the largest of all the social networking sites. Here you will find all walks of life. Facebook is a great place to create brand loyalty and get referrals from current clients. Every time one of your followers comments on your post, that follower’s friends will see your post in their news feed, making Facebook an amazing opportunity for growth. If you are new to social media, creating a business facebook page is a great social media starting point. Twitter- Twitter is all about “real-time” activities. If your company hosts or attends large events frequently, Twitter may be a good option. This micro blogging site allows you to publish tidbits of information that are 140 characters or less. Thousands of these tiny posts will pop up in your news feed every hour, which can be quite overwhelming to those who are not familiar to the site. Go on the site and research keywords for your industry to see who is talking about it, this will let you see if Twitter is a good option for you. Pinterest- This is the most visual of all of the social networks. 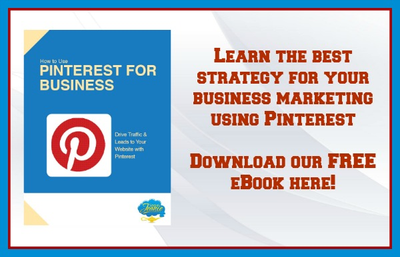 With over 80% female users, Pinterest may not be a fit for every business, but if it your target audience overlaps with this demographic, it can be a very powerful tool. If you sell a visually appealing products or have a service directed at females, Pinterest is swarming with potential customers for you. Pinterest recently released an update, making it even easier for businesses to promote themselves on the site. Linkedin- Known as “the professional facebook,” Linkedin is a great place to look for potential customers, especially if you are in a business to business industry. Linkedin allows you to make a profile for yourself and your business, making your company seem more reputable, and easier to contact. Linkedin is also a great place to share and learn about things happening in your industry. GooglePlus- Although GooglePlus may not have the most traffic, it is still important to your business. Since its release of the new business page, users can now leave feedback right on your GooglePlus business page. Also, since it is created by Google, creating a business account on the site and updating it regularly can only help your rankings in the all-mighty Google search engine. STEP 3: Take them for a test drive. After deciding which ones you want to join, make sure that you take the time to familiarize yourself with the social network before creating your company’s profile. Follow other businesses in your industry to see what they post. This will allow you to see what works and what doesn’t. You will also get a better feel of content that you need to find. When you first start on any social network it is going to be a trial an error process. Remember to stay positive, and to post frequently and consistently. The key to success is interacting with others and being “present” on the site. This means that you need to check and update more than once a week. Schedule social media into your daily routine and make it a habit. Before you know it you will have loyal followers that will become brand ambassadors for your product or service. If you don’t have the time to create social profiles and consistently post for your business, you may want to consider hiring a social media management company, like The Social Jeanie, to take care of all your business’s social media needs.